Julius Caesar’s invasions of Britain, in circa 55 and 54 BC, pertain to audacious military feats that were never tried before by any Roman general. However, in spite of the romanticism associated with the military acts and Caesar’s own narrative about the events, archaeology didn’t provide sufficient evidence that could wholesomely support these momentous historical events. 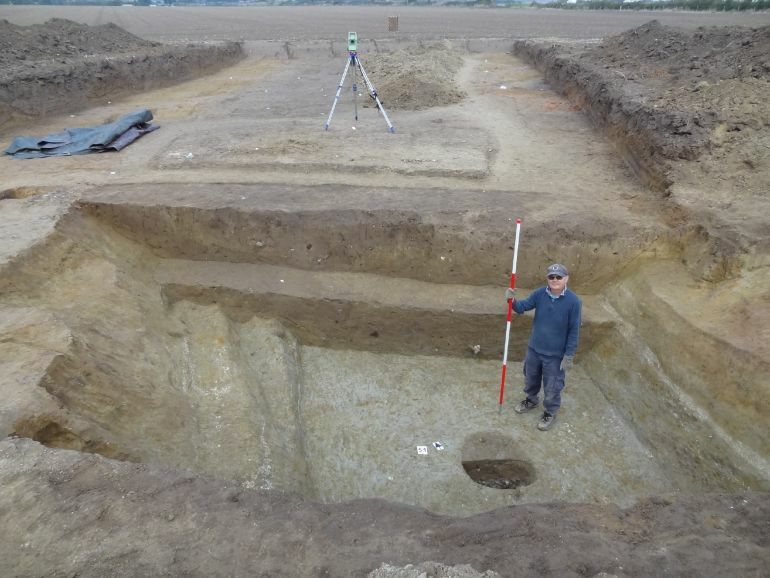 That is until now, with University of Leicester researchers being successfully able to confirm the authenticity of a defensive ditch that was established as a part of an ancient Roman fort constructed by Caesar’s forces. 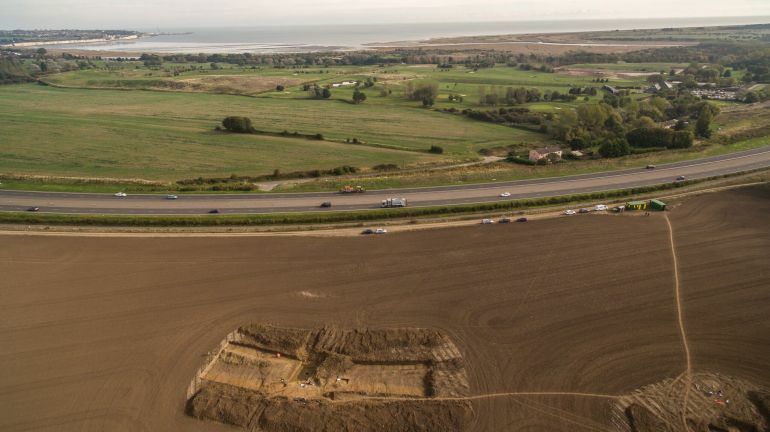 This ditch-like arrangement in question was originally discovered back in 2010, in proximity to the village of Ebbsfleet, on the Isle of Thanet in Kent, which in turn overlooks the English Channel. Back then archaeologists ‘suspected’ that this structural segment was possibly connected to the invasion of Britain by Caesar. 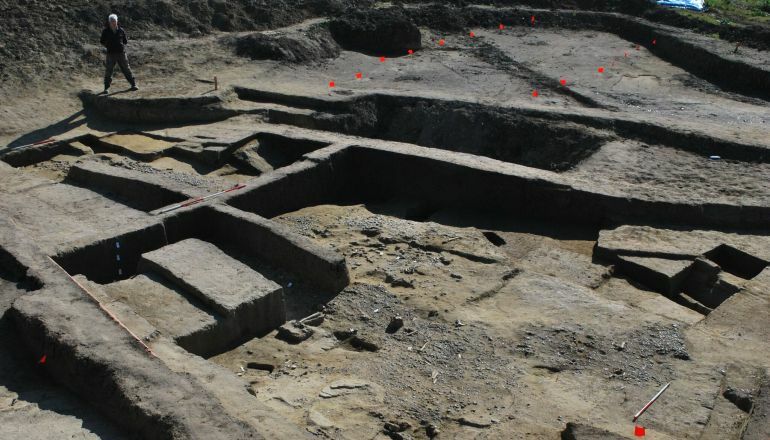 And now, recent excavations (conducted in both 2016 and 2017) have confirmed their hypothesis – with the discovery of numerous pieces of evidence. The pertinent ones among them relate to the remains of humans who met their demise in skirmishes – as could be discerned from the cut-marks on their skeletons. 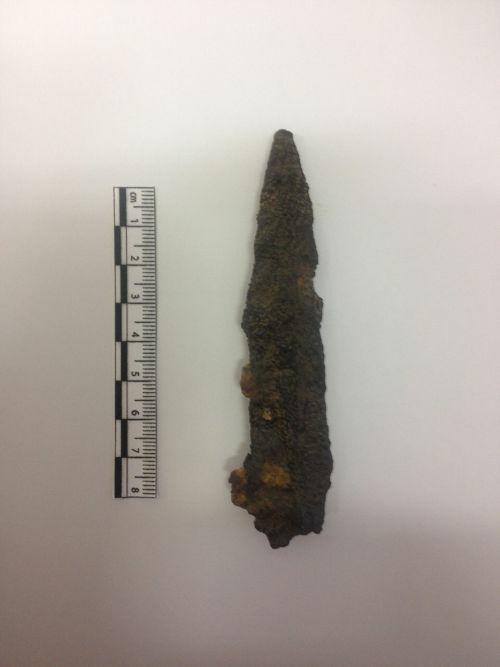 The evidence was complemented by the remnants of iron weapons that were non-British in origin, including the dreaded Roman pilum. This particular specimen (pictured below) matched the variety used in the southern regions of Gaul, from where many of the Roman legionaries were recruited by Caesar for his Gaulish campaign. The British gather to oppose the [Roman] landing in 54 BC, but they see 800 ships — and so they take fright and conceal themselves on the higher ground. So those statements, which are just incidental to the narrative [Caesar] is giving, give us the clues about what the place looked like — and all those clues are consistent with the landscape around Ebbsfleet. By 55 BC, the Romans had managed to subjugate many Gallic tribes, including the factions of Aquitania (south-west France) as a result of victories under Publius Crassus, the son of Marcus Licinius Crassus and a noted cavalry commander of his day (who led as a junior officer under Caesar, much like Brutus). They even managed to make of a show of their strength by crossing the Rhine and ‘defeating’ some of the Germanic entities. But the act that pushed Caesar into the focal point of public imagination back at Rome arguably relates to the audacious invasion of Britain – an incredible feat that was never tried before by any Roman general. Caesar even had the casus belli for invading the foreign (and mysterious) land, with reports of the British Celtic tribes (Britons) helping their continental brethren with ‘possible’ military assistance. But much like Rhine episode, the British campaign was probably more of a calculated move by Caesar to bolster his publicity. Unfortunately, while the notion was clearly cunning the execution lacked in its logistical capacity – with Romans crossing the English Channel at Kent with just two under-prepared legions. The problems were exacerbated when the supporting cavalry forces were unable to make their landing due to high tides. The army disembarked after much difficulty and struggled their way to build a roughly defensive encampment. But they were already cut-off from supplies and the Britons even managed to ambush many of Roman grain harvesters. 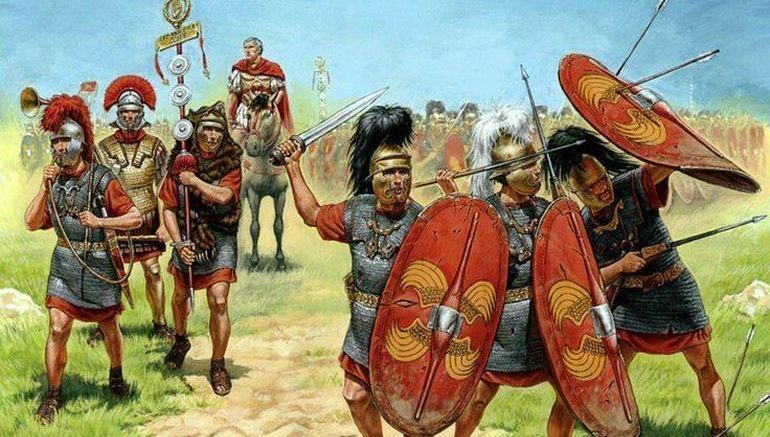 A short-pitched battle ensued with the legionaries just being able to hold their positions, and Caesar promptly demanded hostages from the British tribes. 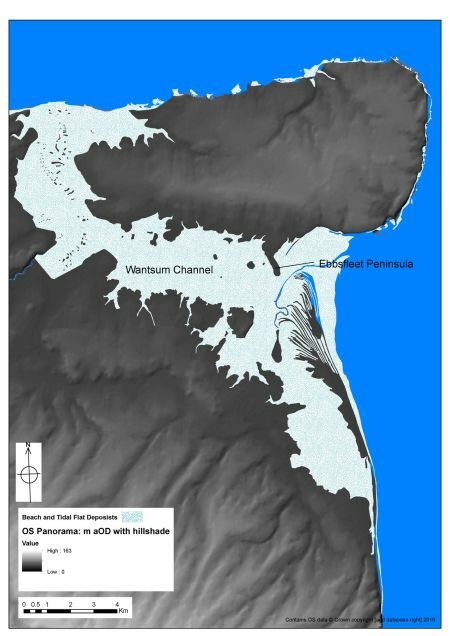 But the precarious nature of his expedition becomes quite evident on account of the Romans withdrawing from the Kent coast on the arrival of spring (and thus storm season) before their spurious demands were met – thus making the expedition last only 20 days. Fortunately for Caesar, his first ‘invasion’ of Britain was wildly celebrated in Rome with a decreed public thanksgiving of 20 days. More importantly, Caesar returned to conduct his unfinished business in Britain in 54 BC – and this time around the Romans was amply supplied by transport ships and reinforced by a total of five legions and two-thousand cavalry. And while having similar difficulties during landing and also facing hit-and-run resistance from the elusive Britons, the Romans finally scored their first major victory in Britain by defeating a big raiding party. They were also able to storm the Catuvellauni capital, the hill-fort of southern Britain’s most powerful tribe (possibly located in modern Hertfordshire), and consequently, most of the proximate tribes surrendered to the Romans. So finally after negotiating opportune terms of surrender and annual tributes, Caesar returned triumphantly back to Gaul. We think that’s because of the links that have been established [by Caesar] almost 100 years earlier that bind the elite of the southeast of [Britain] into the Roman world. The deals that Caesar made helped set the course for the gradual Romanization of Britain and the Roman conquest.